Wherever I ate on Noma-eve was going to have to be good if I had any chance of remembering it after eating at the best restaurant in the world. It was a hard decision as there are loads of interesting places to eat in Copenhagen, eventually I decided on Restaurant Krebsegaarden. Although i’m not particularly interested in art I was intrigued by the restaurant concept. They share the building with a gallery, ‘Galleri Krebsen’ and the restaurant menu is inspired by the current exhibition in the gallery. The restaurant it located on a quiet street just off the main road through the city centre. It’s very small and intimate, with only around 10 tables. I’m glad I made a reservation as every table was reserved. We were greeted and seated by Carston the very friendly chef and one of the owners. The menu is small, with a choice from just 3 starters, main courses and desserts each. Even though it was small it was difficult to decide as everything sounded great. 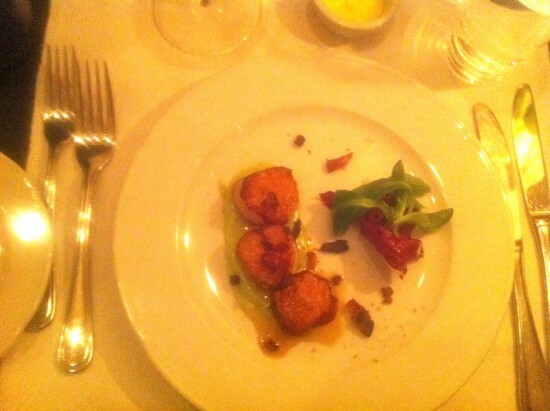 I started with one of my favourites: Scallops. I’ve eaten a lot of scallops in a lot of amazing restaurants and these were probably the best ever. They had an incredible sear on the outside, i’ve never had scallops so dark and crisp on the outside but it was really good and added a really nice caramelised flavour. Inside was beautifully soft and just cooked perfectly. If that wasn’t good enough they were served with pieces of crispy bacon which added an amazing smokiness and took the dish to another level. Just incredible. Main course was braised wild boar with fondant potato and cabbage. 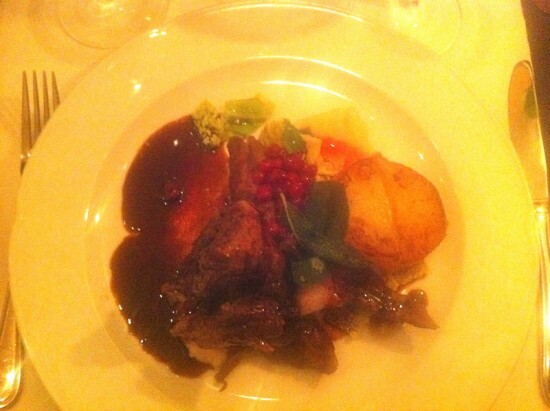 The boar was delicious, melt in your mouth good with a rich deep flavour a sort of cross between pork and beef. It was topped with fresh cranberries, crispy fried sage leaves and the most amazing red wine and wild boar sauce which was just stunning and brought the whole dish together. 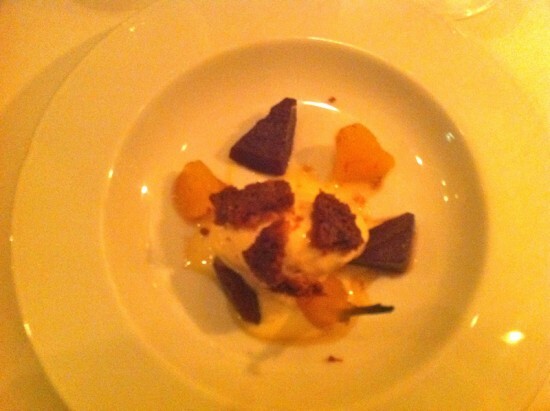 The potato fondant was also excellent, crispy on the outside, soft and buttery on the inside. As well as being chef and owner Carston was also running the front of house, he explained it was due to staff shortages but it was to our advantage as he explained the dishes in great detail. He was particularly proud to tell us how much work went into making the gravy which he’d started making over 24 hours ago! I was happy to confirm that it was definitely worth his efforts. For dessert I picked Poached Pears. It arrived looking very delicate but disappointingly small. It did make up for it in flavour though as the little pear we did have were gorgeous. 6 pieces of perfectly poached pear, half cooked in red wine and the other half in white. Accompanied with delicious ice cream and topped with crunchy biscuit for texture. A really good dessert but definitely too small! Part way through the evening the restaurant filled up with 1 large group filling the remaining tables. They were locals and very loud and rowdy, Carston was actually came over to apologise but I actually loved seeing them, the atmosphere in the restaurant was fantastic. Besides the dessert being tiny I had a brilliant time at Restaurant Krebsegaarden, it was a worthy warmup for Noma. The food is high end but without being overly complicated or pretentious. It is easily at Michelin standard but certainly not Michelin prices. Carston is a brilliant chef/host/owner who is clearly proud of his restaurant and what it stands for which is such a nice experience. I have plans to revisit Noma someday and when I do I hope i’ll be able to revisit Restaurant Krebsegaarden too.